2012 WBC Brew Bar - Marco Beverage Systems Ltd. In 2009, the Uber boiler still very much a protoype, the first WBC Brew Bar (by Marco) came to be in Atlanta. Brewed coffee was acknowledged, an indication of a redressing of the imbalance of attention espresso had enjoyed. 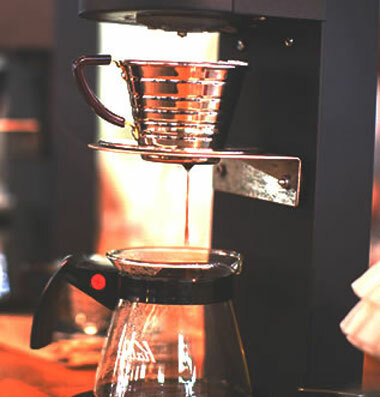 In London, 2010, the Brew Bar was bigger, we were joined by some of our favourite roasters, and we hosted the 2010 World Aeropress Championships. In Bogotá last year, we stepped up on consistency and quality of delivery, but if we are honest, maybe a little of the early wow-factor was lost. This was the original concept sketch dreamt up after HOST last year. This is what will be built in Vienna. The concept is a kind of inside out bar. With grinders in the center, and different hot water delivery at each of the 4 stations. We’ll have 2 Pillars, an Uber Boiler and a Slappy Head. On the arms going out to each station will be pitcher rinsers and cup dispensers. Each station will feature a different brewing device. Chemex, V60, Aeropress and Espro Press. The stars of the show will of course be the amazing rotating lineup of coffees from 17 of the world’s finest roasters. Square Mile, The Coffee Collective, Kaffa, Tim Wendelboe, Simon Hsieh, Solberg & Hansen, Phil & Sebastian, Ritual, Madcap, Handsome, Wrecking Ball, 49th Parallel, Barismo, Koppi, Hasbean, George Howell, and Market Lane. In past years we’ve done a brew bar booklet, which has been really great. But we felt it had been done. So, this year you will find out about the coffee when you are handed your cup. The cups on each station will be unique to the coffee being served at that time. Each coffee/roaster will have it’s own design, but you’ll have to come visit the brew bar to see the rest. Special thanks to Brian Ludviksen, John Gordon and M’lissa Muckerman with whom I’ll be making sure everything runs to plan on the day. Did I mention we are looking for volunteers?